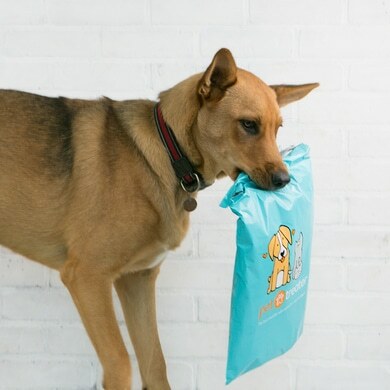 Our BarkBox reviews share all the important aspects of this subscription box for dogs – including what they offer, any available coupons, monthly unboxings, and more! Want to see more possiblities? Check out our list of pet subscription boxes to find the best options for all kinds of pets and price ranges! Monthly Dog Toys + Treats! If you have a dog, you know how much they love new toys and treats. 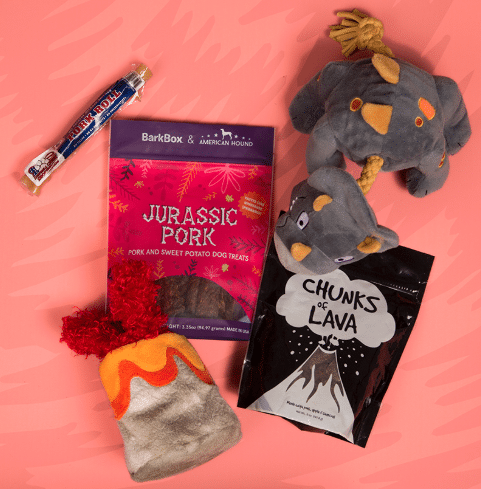 BarkBox is one of the most popular pet subscription boxes that provides your furry friend with fun items every month! These include toys, treats, and chews. Not only is it a fun gift for your dog, but the retail value is always higher than the price you pay. I figured it’d be a cute gift for a good friend’s dog Charlie (and would be fun to unbox with them), so I subscribed to see how they’d like it. That said, my BarkBox reviews will share my monthly unboxings, any savings opportunities, and more about their subscription. I’ll start off this initial review with a little information about BarkBox. Each box comes with products that are tailored around adorable monthly themes and customized for your dog. Your dog will receive at least two all-natural bags of treats, two innovative BarkBox toys, and a chew—all for $35 per month. 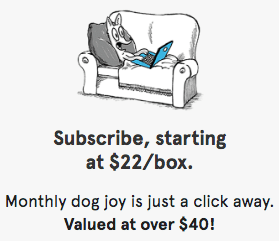 If you subscribe for a six-month period, it’ll be much cheaper at just $25 per box! The products you receive are curated based on your dog’s size, treat preferences, chewing habits, and so on. Plus, they have creative monthly themes that the products are centered around. You can always preview these themes beforehand. They also don’t skimp on quality either—BarkBox treats are healthy and all-natural. In addition, their toys are high-quality and safe for your pet. When you sign up for BarkBox, you get a few different customization choices. First, they ask your dog’s name and what size toys they like to play with (small, medium, or large). Next, they ask if your dog is allergic to beef, chicken, or turkey. They’ll give you an allergy-friendly box if so. Finally, you choose a monthly, six-month, or annual plan and create a BarkBox login to finish up your order (the $5 deal shown in the picture below is only temporary). You can also choose to add another toy to your dog’s box for $9 extra. Even though there are a few customization features available for the regular plan, BarkBox offers a special Super Chewer box as well! This is built for dogs that destroy toys quickly, which means they’re more durable and will last longer. I discovered in BarkBox reviews on Reddit that they offer a free tougher toys customization option in the regular box, but these will only be a little bit tougher. They won’t be suited to dogs who destroy toys within days, which is why the Super Chewer box is a great option. 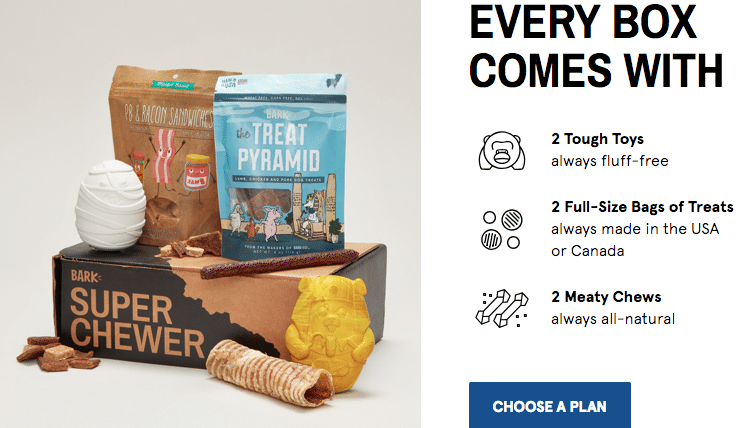 You’ll receive two toys, two full-sized bags of treats, and two chews (one extra chew than the regular plan) with the BarkBox Super Chewer option. The price of this subscription is a little more expensive at $39 per box with the monthly plan, $34 per box with the six-month plan, or $29 per box with the yearly plan. One of the best parts is that they guarantee their toys will last—they even promise to replace any toy that gets destroyed for free! In a few BarkBox reviews, a large dog destroyed the toys too quickly and the owners complained, but later they commended their customer service for replacing them. Many pet subscription boxes have some type of program that donates to charities or helps animals in need in some way. BarkBox does as well! They partner with a variety of organizations through affiliate programs. With each new subscription that’s purchased through special coupon codes for each organization, they give a $25 donation to that organization! BarkBox offers all kinds of deals and coupons. 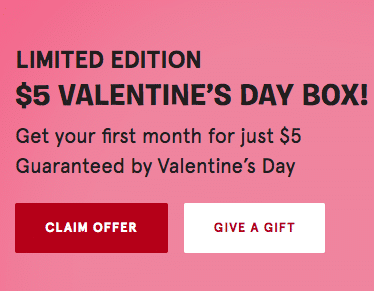 For example, they’re offering a great Valentine’s Day deal – your first box for $5 with a 6-month or annual subscription! They also have a monthly coupon available for a free box with your order. “Pitbull” is the code for this! Although this BarkBox coupon is being offered at the time I’m writing this, they change very often. My monthly reviews will always share updated deals and coupons. BarkBox isn’t the only pet subscription box out there! We even created a list dedicated to the best ones. As you can see from our pet subscription boxes list, there are plenty of options for your furry friends! Although there’s no BarkBox for cats, you’ll be able to find a few cat subscription boxes on this list if you’d like to get a gift box for your cat as well. In addition, I’ll be comparing a few of the most popular pet boxes to BarkBox in the following few paragraphs. Pet Treater is another popular pet subscription box. Unlike BarkBox, they offer boxes for cats as well as dogs. Although I don’t have any Pet Treater reviews as of yet, I’ll be trying this subscription out very soon, so stay tuned! They have cheaper boxes as well ($15 per month regularly or $25 per month for the deluxe box). You can choose a box with just treats, just toys, or a mixture of both. The smaller box will include 3–4 items and the deluxe box includes 5–8 items. Like BarkBox, these dog subscription boxes provide all-natural treats and toys. 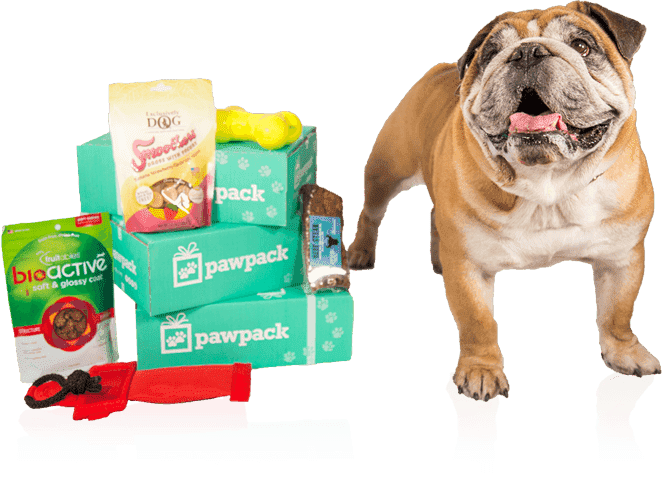 Pawpack is a bit cheaper at $29.99 per box if you choose the monthly plan. They have a few different box types to choose from. The best part is that a portion of each box goes to a pet-related charity—you can even pick which one at checkout! Although many BarkBox reviews mention their charitable donations, they don’t allow the subscribers to pick the charity as Pawpack does.